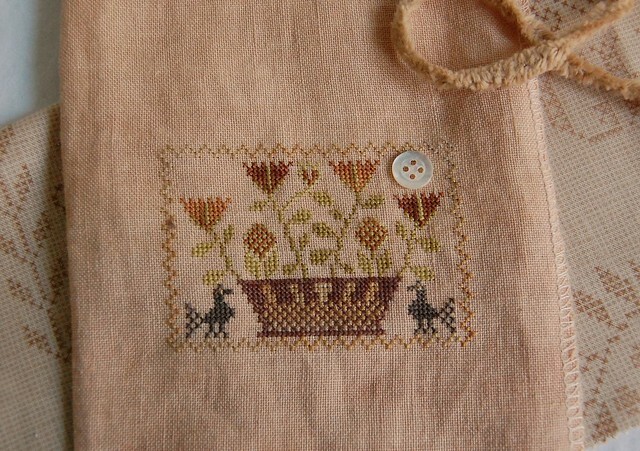 It's the Pumpkin Blossom Pin Cushion from the Blackbird Designs Autumn Loose Feather chart. I plan to finish it using the fabric and chenille shown with it. My other two finishes are a couple of stockings from the Blackbird Designs December Stockings leaflet. I really messed up on one of the stockings, but I wasn't about to rip it all out. It is just an ornament after all - I don't think anyone will notice. Now I just have to get these things finished!! 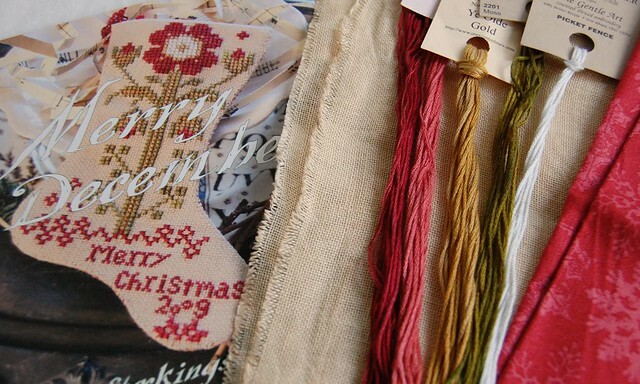 I also plan to stitch the third stocking from the leaflet. This one is my favorite - I love the colors. 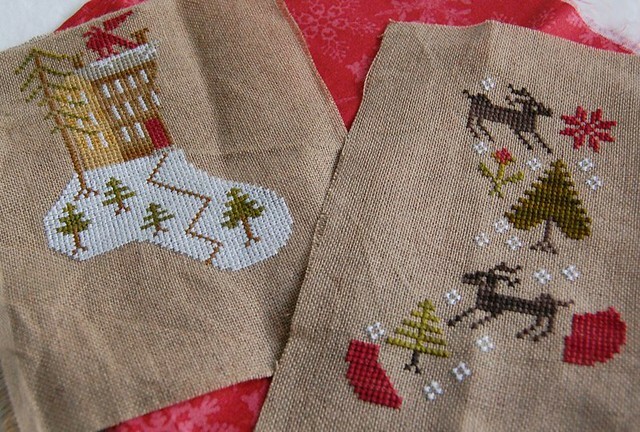 I plan to use the same backing fabric as the stocking I stitched earlier in the year. Well, I'm so glad my slump is gradually leaving. I'm starting to get that little thrill from my stitching again. Hopefully it continues! I've definitely missed it. I think working on a couple of small things was the right thing to do. Thank you all for your encouragement! Write soon! Great finishes, Nicole! Love them all! Glad you see you enjoying your stitching again. Great finishes Nicole! Sometimes those small little finishes really help to get your mojo back! What beautiful finished you have there. You know, I had no intention of stitching those BBD stockings but now, after seeing yours, I really want them. Ha! You've been very busy. Cute pieces. Nicole, so glad that stitching thrill is returning! Pretty finishes! I love everything you posted. The colors are gorgeous. If there are errors in one of the stockings, I sure can't see it. Your finishes look wonderful Nicole. I'm so glad you're out of your stitching slump. YAY Nicole! Hopefully your slump is OVER! Darling finishes! I am officially a Blackbird junkie! Wow~~~ Gorgeous finishes!!!!! I love the colors on the stockings~~ So pretty!! So glad to see that you are enjoying your stitching once again! Looks like a little vacation was all you needed. Have a wonderful Christmas. Wonderful finishes! Glad that you are starting to enjoy your stitching again. Wonderful finishes! I'm glad you found your stitching motivation back. All the stockings are lovely, Nicole! I'm glad you are recovering from your stitching slump! They're all so pretty, congrats! Beautifully done, Friend! I so agree that a few smalls will bring that sense of completion and accomplishment. Of course I love your choices for finishing - can't wait to see them! Glad to see that your stitching mojo is returning! You have some lovely sweet finishes there! Gorgeous finishes and it's so nice to see a stitchy post from you :-). I'm glad your slump is gone Nicole! What lovely finishes!!!! Beautiful stitching, and I really love those BBD stockings. Glad your slump is starting to go away! Love those sweet designs. And it sounds like they were just the ticket for mojo motoring! Such sweet colours! Great finishes! Such fabulous finishes! I just love BBD designs! Can't wait to see your stockings all sewn up! Love your new finishes Nicole!! Glad your slump is beginning to go away. It took me most of this year to get back to stitching but I am working still on Sarah Elizabeth Brooke and loving it so far. Beautiful finishes! I am so glad that you are feeling like stitching again! Very pretty finishes! I always love Blackbird Designs pieces. Please to see that your stitching mojo has returned. How sweet are your finishes! Nice work, Nicole. Wonderful finishes, you'll have them all done in no-time at all. Cute finishes, Nicole. I love all those little stocking. I have all the BBD charts, but I have maybe eight stitched :-). Looking at yours, I so feel like stitching mine !! Lovely finishes Nicole!! Glad I found your blog again...darn Blogger, LOL! Great finishes Nicole! I love those stockings. You do such beautiful stitching, glad you are getting your groove back. Amazing finishes! Congrats! Glad you are getting your mojo back!